Star Se eds Vets Unite! How many of you out there have had pancakes at 4 am at Star Seeds Cafe (or, for that matter, their spinach-laden breakfast tacos at any time)? On Friday night at Beerland, two former Star Seeds employees got together with other pals for an evening of often loud but never boring music ... and lots of good times. Naturally, flanfire was on the scene, because he, too, like many of you, loves to hang out with John Hunt and the Zookeeper. Now it is not just any Friday night one hops off IH-35 at 8th Street, turns north onto Red River and parks in front of Stubbs to walk half a block to the club you are headed for -- so when this actually happened I knew I was in for a good night. The Paper South (Justin Bankston on bass, Shawn O'Keefe on vocals and guitar, Ken Hatten on guitar, and John Wilkins on drums) opened with a short set -- this is emotional rock with lots of angst and hooks that sometimes sounds like electronica (with reverbed vocals) and songs like "Caught Leaving the Scene of the Accident." I'd like to hear this band play outdoors ... instead of on concrete floors that deaden the aura the guitars are trying to create. Hatten was a founding member of American Analog Set -- this is a brand new band that also includes members from Winslow (or so says their myspace page). Next up was Fivehead -- Fitchburg State's gift to Austin (thanks to Texas State for enabling our pal John Hunt to return to the scene of his many crimes). My favorite Star Seeds manager of all time (who actually hired Chris Simpson, the Zookeeper, to enslave him at the all-night eatery) is back with a vengeance playing with his mates(Jeff Jones, F. Beaty Wilson, and drummer Davis Comeau) playing what I call "white noise rock punk" from their library of song and even brand-new material inspired perhaps by John's new life in flash-flood isolation in Hays County. To be honest, the bouncing off the wall guitars made it hard to catch the vocals, and I had not heard Fivehead since they helped close down the "old" Hole in the Wall (a sad day in Austin music history that was soon forgotten when the Austin's Pizza folks reopened and renovated our hallowed hall). I think I heard lyrics about a "south American summer" and the "big mistake factory" and what goes on "till the killing starts," but if you want to catch the words, just buy the CD's -- what you get live is just pure energy - and on this night perhaps a little frustration over the Patriots' loss to Indy. All this pounding just makes you feel goooood! Speaking of pulsating rock and roll, how about One Mississippi? Now there was ANOTHER Shreveport guitar player in town Friday night over at Antone's, and Austin is also blessed with Papa Mali and jazz guitarist Pat McCann (among others), but if I had one Shreveport guitarist to be stranded with on a desert island, it would have to be Dr. Ron Byrd -- because he has been keeping me alive ever since I moved to Austin in 1999. He's also a pretty fair country songwriter and gunslinger, too! Fellow Prescott Curlywolf guitarist Rob Bernard is the other primary front man in this ensemble, and Grand Champeen's Alex Livingstone plays bass and sometimes sings -- and then there's Conrad Choucroun holding down the beat. Early favorites from this set included "Fe Fi Fo" and the brand-new Dr. Ron song, "Kid Abandon." The band promises some EP's will be available very soon. This was my first rodeo with One MS -- and it was a real gas! I am especially looking forward to shows at the Hole in the Wall (where I can ALWAYS hear every word!). And, by the way, the band also has a song about "Fractions" that apparently entitles the listener to CLE credit (or credit toward a GED). On the Ark with the Zookeeper! But back to Beerland (which does provide Independence and Real Ale products on draught!) and the evening of Star Seeds music. My dimwitted brain had never connected that shyly unassuming waiter Chris as being THE Christopher Simpson of The Gloria Record (a band whose music I loved though I never saw live) -- the man now known simply as "The Zookeeper." But lots of my friends -- including Kullen Fuchs, who often can be found on stage with this band -- have been telling me I HAVE to hear this band. With fellow Glorian (and birthday boy) Ben Houtman on keyboards, plus Ben Lance and Seth Woods from The Sad Accordians (guitar and bass) and Alex Dupree (he of the Trapdoor Band) and rotating in drummer Kevin Bybee, the Zookeeper brought relief to the ears and the soul with this rich sound that built slowly to a climax as the too-short set ended. The Zookeeper last October released a CD with five songs -- including "Tax Collector" (who is coming for your soul), "Flood of Love," and "Delivery Room." Another EP-style CD is due soon, and the Zookeeper promises a full-length "glorious" package later this year. I have got to get to know these songs better! But "Flood of Love" showcases much-in-demand percussionist Cully Symington and the amazing versatility of Kullen Fuchs on vibraphone, trumpets and heaven knows what all else ... and a crescendo finale that is uplifting. And while eight players are listed, you get the feeling there is a much larger chorus somewhere in the background. After all, 11 players are listed on "I Live in the Mess You Are," including Erin Lance on saw (and I have seen her perform -- she is AMAZING!). Crowning this disc is "Two-Part Invention," recorded at home on microcassette, which brings back memories of the great Bill Withers anthem, "Lean on Me." There is this whole group of young bands in Austin whose music has that remnant of English Eighties music but with a totally American take on the lyrics ... and lots and lots of colour (well, that's British!) and texture (that's American) .... music that is very listenable and very personal (and intense). And there is considerable overlap among these bands, who seem to feed each other's energy -- I can see an emergent sound that may yet be as identifiable as Seattle's grunge revolution 15 or so years ago but which is much more hopeful in its spirit (maybe because it rains less here) ... and indicative of the growth of Austin from a country town into an urban city. I can imagine an outdoor festival with these bands and lots of flowers, bubble blowing, and tie-dieing with that sort of post-psychedelic "summer of love" beckoning to lay down burdens and masks and be vulnerable again. But without the hidden undertow of anger that shocked the Hippie-Yippie generation. Sometimes when I am in the company of these young guys (mostly) I feel as though I am back on P Street Beach at Washington's first Human Be-In and it's 1967 all over again -- but with no crash and burn after the party's over. Our Man Flynt! Still Rocks! Kudos to my pals Scrappy Jud Newcomb and Penny Jo Pullus (and Emcee Cleve Hattersley until it was past his bedtime!) for a wildly successful tribute and fundraiser for 12-year Austin icon (and native Okie) Ron Flynt! And pats on the back to the many who brought their talents to the stage (and to the mixing board, the donation table, and the cookie jar and more). For those who do not already know all the details, Ron Flynt (even today of the LA and Tulsa-based "power pop" band 20/20) came to Austin in 1994 with his lovely wife and three kids, set up Jumping Dog Studio and eventually put together a new band, the Bluehearts, as a vehicle for his own songs. Friends tell the story that Ron has recorded, produced, engineered or help "literally hundreds of musicians" in Austin with their own recorded music projects, "often giving special deals and too-generous payment plans to those who could barely afford to record with no label support." But last September, Ron had just settled into his new, smaller (kidless) home and was hanging drywall at his new rented space recording studio when he slipped off a ladder and badly shattered his elbow on the concrete floor, such that the bones between his elbow and shoulder were pulverized. After two surgeries and (ugh!) physical therapy, Ron is able to play and record again (his vocals were always strong! ), but as fate would have it, the lovely Brooke lost her job and thus the family health insurance at about the same time when her company picked up and left town -- and the bills just piled up waist to armpit deep. As they have done for so many others (including this writer) in the past, Ron's friends circled wagons and set up shop at the Continental Club -- but not before wiping the dust off a 2003 CD of 22 songs by Ron and some of his myriad friends -- "Justamusician: Burnt Gold and Crushed Diamonds." The CD is replete with the memories of psychedelia (including some digital cover art and hippie children in a golden field). Highlights from this CD (which I would suspect is still available for a reasonable contribution -- check out the website, www.ourmanflynt.com for details on how to contribute if you missed the show) include Arthur Dodge and the Horsefeathers with Gene Clark's "Why Not Your Baby? ", Sandy Allen doing my favorite Moby Grape song ever -- 8:05, Kevin Carroll (who introduced ME to Ron one night at Flipnotic's when he was serving as Kevin's sideman) on Fred Neil's "The Other Side of This Life," and and Ron and the Blue Hearts doing "Chimes of Freedom." The CD closes with "A Day in the Life" as performed by The Back Pack (recorded in Berwick, Maine) -- a fitting ending to a CD dedicated to John Lennon and George Harrison -- and, yes, The Beatbabies cover "Bad to Me." But I digress. The "Big Break Event" began a little before I got there, and when I walked in Scrappy Jud had climbed on stage with Stephen Bruton and Malford Milligan, and the great one sang two Bruton songs -- "Teach Me How to Stay" and "Too Many Memories" -- I knew I was in a wonderful place already. Then it was a song apiece by Kevin Carroll, Jon Notarthomas, and Becca Jones (who had donated a Fender guitar that was raffled off to help the cause and who really got the crowd going). And then it was Michael Hall with Jud and Don Harvey -- and Julie Lowery on backing vocals -- doing a song written just for Ron, "Out Where the Highways Roll," and then "Amelia." It only got better -- Craig Marshall (what a crooner! doing his "Desperately"), Darin Murphy (cracking us up with his Aunt Biddy voice in a backup role and then doing one of his own), and Billy Harvey (who sang the LEAD on "Beautiful Man") -- and then it was PETER CASE (who goes back with Ron all the way to LA and whose son Joshua Case of Austin played lead guitar for a very very rocking set with the Promise Breakers that included an awesome rendition of "I Shook His Hand" (about JFK). Then a regrouped 20/20 stepped up to the stage (with Cornbread on bass, Rob Lee on drums, Steve Allen on guitar, and Ron himself on keyboards and some vocals) with a KICKIN' version of their old hit "Yellow Pills" (and more). The lovely Penny Jo insisted then that Case get back on stage with 20/20, and so he and Allen jammed out on the old Plimsouls hit, "A Million Miles Away." The crowd was going BERZERK!!!! And then Miss Pullus stopped the truck with a haunting rendition of Sylvia Fricker's "Someday Soon" -- and just as quickly melted back into the crowd to make room for her bandmates -- Chip Dolan and Marvin Dykhuis along with Don Harvey and Charlie Irvin just blew the place apart with Guy Clark's "Baton Rouge" and Chip's own "Bucktown," written in the wake of Hurricane Katrina. Then it was Walter Tragert (backed on "An Additional Glass of Wine" by Penny Jo and the lovely Bonny Holmes) .. and folks, we were not through! Julie Lowery assembled her colleagues in the Fire Marshals of Bethlehem (which will be in studio soon, she promised!) -- and those who still had energy to stick around were blown away. Bandmates include the Robbie Eriza (The Way Outs) on lead guitar, hubbie Hunter Darby on bass, John Ratliff on keyboards, Steve McCarthy on drums, and the amazing Jenny Smith on fiddle (but she's really a classical violinist!). After opening with an old 20/20 hit, Julie and the band burned down the house with "Rabbit" and "Lawrence" -- two originals that will soon be available for listening live at the Carousel Lounge (we trust). And still there was MORE! From Austin's (by way of Reno) Small Stars -- Guy Fantasy and Buddy Llamas leading the pack with Godfrey McCambridge and Brick Masterson and a red-coated keyboardist whom I think is new to the ensemble again recharged those exhausted by five hours of musical bliss and lots of big smiles from Our Man Flynt! Folks, you have to see these guys -- maybe at FronteraFest at the Blue Theater on January 27, 28, 30 or February 4??? Songs for the evening - "Let's Hit the Town," "Miss You," and "21" -- all featuring Llamas' fine tenor sax and great looks! The Alice Rose of Texas! What is it about Roses and Texas? We have the Yellow Rose (used to have Yellow Rose beer until the EVIL Miller people bought up Pearl and closed the Pearl Brewery in San Antonio where this amazing, and very strong, beer was lovingly created for superior enjoyment); the Tyler Rose (and of course Tyler has quite a rose garden that is well worth the trip -- I once saw a full-scale Arthurian era wedding at the place! ); and my friend the wonderful Laura Rose (of Body Choir). Now comes The Alice Rose, named after the niece of a dear friend who passed away at age 16. As the story goes, KLBJ-FM deejay Peggy Simmons can take credit for inspiring the trio of guys who started off together in Huggies in her living room -- she also made them do their homework (or so she said in an April 2000 interview). That trio, at the time going by the moniker PigPie Hat, is singer-songwriter (and guitarist, but he also plays some piano and percussion here) JoDee Purkeypile, bassist (plus vocals and percussion) Sean Crooks, and drummer Chris Sensak. Lots of folks compare JoDee to John Lennon, others to the late Syd Barrett of Pink Floyd; still others find other influences -- and now JoDee says the band is headed toward Motown. It is easy to see the Beatles' influence on this poprock record -- but just as much in the coded lyrics as in the music itself. "Light Up! "includes "give dirt to me, my love, I'll put my past to Rome. You alone Tombstone the Earth." "Save Me" calls out, "Save me. Only you could understand that I am just a child, just an actor,understand. So alone, and yet surrounded everyday. While you jilted claim your days for a vision that retains every instance of the part that you play." "Lamplight" starts a little tougher -- "I want to break my back to bring you good luck and you to feign my curse." "Ocean" really hurts -- "The night Gods took your life I can't say where I was. You were an angel in disguise and now I denounce the ocean for us." "Saints" -- "Sleepin' at someone's house where roses grow to be mowed down, the very thought of which means not too much to me over an endless row of nameless tombs entirely white." "All over Your Body" is another lamentation -- "Sitting by a fire weeping I'll tend to your two eyes leaking ... What was the hallowed thy name decline? Like one's own luck run out and blinking, why did she have to die? Where did you buy that pack of lies?" "Wisteria" continues the theme -- "Ride into the road, no answer, changing to phone. My whispering girl seems in this instance like stone ... In every sad shape her face and figure survive, as, after all, it's bones that die." But then the deeper secret here -- "My Wisteria, she's never gonna show somebody her soiled hands ... When other girls are envious of her looks, she hides out in her books and pines." "West" -- "Walking on a wooden bridge to see for the blind. Fall only as I. If I ever could, I'd try." This was the cut that NPR picked as its song of the day. "Stop" (the oldest cut on the disc) speaks of Mesa Hills and admits, "There's nothing I can say to put your mind at ease... Just take the blindfold off my eyes, I know you're frightened by disguise." And finally, "This Night" -- "This night our love has yet to come, and those who lone can find someone ... "
These songs are not easy to sing along anthems -- though I think fans may pick out favorite lines (but rarely whole songs) to identify with. But musically, for me they bring back the bouncy days of The Hollies, Herman's Hermits, and that whole genre of "chewing gum on the bedpost" kind of hopeful stuff that even included darker lyrics (like those in "Alone Again, Naturally" -- recently covered by Michael Weston King). It's like you write happy melodies to cover the sadness in the real world memory bank. The Alice Rose plays some February gigs in San Marcos and San Antonio and gets back to Austin on March 3 at the Hole in the Wall -- and then they're off on a trip to Chicago in April for the International Pop Overthrow Festival ... for more info, check out www.thealicerose.com . Papa says of himself (in the liner notes) that, "I welcome those who occupy the spiritworld - and they know it." He attributes the direction and oversight by spirit beings to his position is a "self-proclaimed and rightly ordained High Deacon of the Divine Assembly of Freaks and Heads." On this recording, he says, the dead comfort the living and the living honor the dead ... from Bossier City to Sugarland." 1 = What band played at Papa Mali's wedding? 2 = What hobby of blind pianist Henry Butler has won him fame? 3 = Which song on the CD has its origins as an Appalachian ballad? 4 = What musicians recently played with Papa Mali at the famed Preservation Hall? Plus, as you carefully examine the merchandise, you will discover an unannounced track 11, which is in fact "Hallelujah I'm a Dreamer," a song written by Lafayette, Louisiana's David Egan and featuring Papa Mali on acoustic guitar and backing vocals by Victoria Williams. The disc includes a two-part documentary about making this record and a live performance (sans Mari Gras Indians) of "Early in the Morning." The swamp rock guru opens the collection with Isaac Hayes' classic "Do Your Thing," but with a tone that Brother Hayes may never have envisioned ... and then, surprisingly, Papa is singing like Harry Connick, Jr., on "Honeybee" -- this jazz number is totally unlike anything the dreadlocked one has ever done (to my knowedge, at least) in public much less on disc, with Dirty Dozen Brass Band sousaphonist Kirk Joseph thumping out the rhythm and "the pride of New Orleans" Henry Butler transforming the tune with his piano improvisations of notes that literally fly off his hands. Papa admits this is his crowning moment. The very next cut is OLD SCHOOL Papa Mali -- "Early in the Morning" - sounds like Nawlins music with Reverend Goat Carson and the Golden Eagle tribe of Mardi Gras Indians (led by Big Chief Monk Boudreaux) -- close your eyes and you are THERE catching beads and eyeing a little FLASH. This is old-time call-and-response music that dates back to ante-bellum days. After "I Had the Dream" (you will just have to hear it), we move onto one of the PURE PAPA numbers (that dates back to his childhood daze in Shreveport)... as Papa sez, Jimi Wilson wrote some of "Little Moses" with him when they were both kids..... which tells quite a story about Moses (Henry) and the Lawd! Moses told the boys, "It wasn't lightnin' that burned the churchhouse down." Indeed, he began "steppin' out" the very day he started walking ... and "... when the devil is your teacher, then it's the devil you must pay." (And so Moses could not follow his daddy as a preacher) -- He "walks the street and mumbles" and "sleeps out in the cold" because "the only girl he ever loved has put a curse upon his soul." Then it's time for "Coffee," which is more drum-stomping funk, and "I'm Getting Over It," which tells a sad tale about the guy whose unhappy ex left his car in the swimming pool and his clothes strewed all over the lawn. My two very favorites on this CD come next -- "Girls in Bossier City" and the incomparable "Sugarland," which should be garnering major airplay on a variety of radio stations (including XM and/or Sirius). Both of these dirges (some call them seances!) feature Papa's mournful guitar and Kidd's pounding drums. "Bossier City" speaks of seeking "the golden crown," while Sugarland surpasses Papa's work (with the Big Chief) on Dr. John's "Walk on Gilded Splinters" from the Thunder Chicken CD. The cut opens with a bold guitar riff, then you hear the sound of water running and more ... and then the mourners begin their chant that leads into Papa's lyrics ... "I will not be forsaken to live and die in Sugarland." The Big Chief later says he is standing at the crossroads "trying to find myself" -- If you see me there, "don't axe me where I'm going.... because I am trying to find my way." But then Papa pulls yet another surprise with his equally dirge-like rendition of "True Religion" that is very different from the version he does as a member of the Harmonizers or the version done by guitar god Jorma Kaukonen. Victoria and Malcolm are out on Lake Bisteneau or somewhere on Line Avenue in Shreveport and it's 1973 (or so) -- meanwhile, guitar legend Chuck Prophet joins in on electric guitar and percussion (as Papa plays slide), all in a minor key. Those who regularly see Papa Mali playing some of his myriad guitars may be disappointed there is so little of his powerful and poignant lead lines here. Instead, what you get is the spirit of Louisiana in this wonderful recording and the recognition that Papa Mali may play for free at Maria's but he is one of the nation's - maybe the world's - premiere musical talents, and oh by the way a pretty wonderful chef who once taught a cooking class at Central Market. Papa Mali Scores as Performer, Producer! Malcolm Welbourne hails from Shreveport, Louisiana, and as a youngster used to slip into clubs where white boys did not normally belong. He also spent wise time taking guitar lessons and learning other valuable lessons from bluesman John Campbell (whose music is being celebrated at Beerland on January 19 and 20). In my many conversations with this founder of the Imperial Golden Crown Harmonizers, Malcolm once told me about heading to New Zealand while still a teenager and later working with the late Michael Johnson to form what would become Austin's signature reggae band, "The Killer Bees." Malcolm has six children, all mostly or fully grown, and he got his nickname -- Papa Mali -- from his reggae friends in Burning Spear, but the man has become a father to a new generation of Austin music while at the same time holding himself to the fire since waking up one morning about a decade ago and realizing his life was a mess. He decided to stick around the house and not spend all his time on the road and work on his responsibilities at home -- and the Harmonizers was in large part his gift back to his own personal God who had given him a new chance at a better life. Keeping on this better path, Papa Mali eventually began to feel more confident (and his children were older) and got a new agent and began to tour again -- in fact, you will find it hard to see him (except maybe once a month on Sundays at Maria's Taco X-Press) in concert for the next couple of months. His career has literally taken off -- not that he has gotten that much better as a guitarist -- he has been amazing since the first day I heard him play (on Easter Sunday, 2000, at Shaggy's). But I digress. Papa Mali has turned "The Phenomenal Ruthie Foster" back into a rhythm and blues - pure soul - singer while producing her brand-new CD that is a MUST HAVE for any serious collector. He also has his own brand-new CD, produced (as was "Thunder Chicken," his debut solo CD) by Dan Prothero, that HAS TO BE PLAYED at any party you intend to throw in the next several years. To the bricks first with Ruthie (who just got back from touring with Bo Diddley), whose next AUSTIN gig is February 15th at Antone's. Folks, this is Ruth Brown meets Mavis Staples if you know what I mean. Ruthie contributes "Heal Yourself," "Harder Than the Fall," "Mama Said," "I Don't Know What To Do with My Heart," and half of "Beaver Creek Blues" (with Cyd Cassone). She throws in songs from Lucinda Williams, Sister Rosetta Tharpe, Son House, the amazing Eric Bibb (son of Leon Bibb), and more ... and plays some piano and guitar -- but not all of it, given the availability of Papa Mali himself and friends like Glenn Fukunaga (bass), George Stuppick (drums), Dale Spalding (harmonica), Gurl Morlix (lap steel), Anthony Farrell (piano, organ - and songwriting), Mike Dillon (vibes, congas), Ned Stewart (special effects), and the Tosca String Quartet. And, by the way, the CD title comes from a Maya Angelou poem, "Phenomenal Woman," who was put to music by Amy Sky and David Pickell and transformed into pure energy by Ruthie's powerful vocals. My friend Natalie Zoe was blessed to sing backing vocals at Ruthie's holiday show at The Saxon Pub, and she reports that people stood up and applauded for a long time at the end of the set -- "phenomenal" is truly the right word here, and it goes far beyond her on-stage performance. This is a woman who, after all, gave up a promising career in NEW YORK CITY to come back to Gause, Texas, to care for her mother during her last few years this side of heaven -- and is ever thankful for making that hard choice. You know you are getting a different Ruthie about two notes into the opening number -- the very soulful "'Cuz I'm Here," written by Farrell with Zak Littlefield and Andrew Trube of The Greyhounds. But when Ruthie gets into "Heal Yourself," the house is ROCKIN' -- sounds like Ray Charles! Next, Ruthie channels Sam Cooke on Lucinda Williams' "Fruits of My Labor" (from her "Live at the Fillmore"), turning Lucinda's white trash anthem into a work of wonder. Then Ruthie goes back to the blues -- Son House's "People Grinnin' in Your Face" is a capella at first; the second verse adds backing vocals and handclaps and footstomps, and the song builds with wails to its climax. Then it's the gospel of Rosetta Tharpe - "Up Above My Head (There's Music in the Air)" -- and you KNOW there is a heaven somewhere when you hear this number (with Papa Mali's backing vocals) -- and, yes, this is gospel funk with that wicked organ and rhythm section (in fact, it sounds a lot like Bobby Blue Bland!). "Harder Than the Fall" is a fusion between folk and soul -- and (as her bio admits) very open and honest (as is the final cut, "I Don't Know What To Do with My Heart," which features the Toscas). "Beaver Creek Blues" is a shuffle that is indeed a paean to her earlier sets with co-writer Cyd Cassone (and includes some creeklike noises). But it is "Mama Said" that shows Ruthie at her most soulful -- and spiritual. Here, Papa Mali and Dale Spalding weave a mournful tune behind Ruthie's righteous vocals -- musically, this is the top of the mark, and it is clearly personally confessional. The only thing better here would be Ruthie and Carolyn Wonderland doing this as a duet -- and taking about 15 minutes in the process. Not that it is really downhill from here -- in addition to the Maya Angelou poem (which is akin to a pop anthem), we are blessed with Bibb's "A Friend Like You" -- which is yet another soulful hymn that would stir any congregation (especially any East Austin congregation) on a Sunday morning. "Joyful is my soul every time I think of you, sweet music is the gift you bring... thank you for the songs soaring in my heart, your love makes me sing ...." Just imagine Mavis Staples singing this one ..... And it segues into the Tosca strings ...... and a song that should be Number One with a Bullet on the Billboard R & B charts (do they even still exist?). Will, Phil and the Gang Rock KUT! KUT listeners got a preview of Saturday's Hendrix Show featuring Will Taylor and Strings Attached in collaboration with Hendrix interpreter Phil Brown (plus Nakia, John Pointer, and Natalie Zoe). This show, my friends, is turning quickly into a genuine labor of love. Start with Jason McKenzie PLUS Pat Mastelotto on drums and percussion. Jason (whom I met years ago playing tabla for Ginger Leigh at a benefit at La Zona Rosa) and Pat (Mr. Mister, King Crimson) have -- it turns out -- been friends for 10 years, and have apparently taken lessons from each other (I am not going to reveal any REAL secrets here) -- and play together as though they had been doing so for a long time. Funny thing -- neither Phil (who has been working with Pat) nor Will (who has long worked with Jason) knew about this relationship between these two amazing players. Will, guitarist (and bassist) Glenn Rexach, and bassist (and trumpet player) Steve Zirkel have been working together for 18 years -- Shawn Sanders is playing cello in this lineup, with Will swapping out on viola and violin. Nakia and Pointer have worked with Will on several shows -- and, yes, I was fortunate to be one of several direct links between Phil and Will (the first, apparently, was the lovely Wendy Colonna!). Nakia sang lead on a slowed-down version of "Voodoo Chile," which opened bare with violin and tabla (Jason), added cello and muted trumpet and bass and built slowly to accompany the power of Nakia's vocals. Perhaps the crowning moment of the day was "(Let Me Stand Next To Your) FIRE," which featured all four vocalists taking parts of verses before a quieter interlude that opened into a Rexach bass solo and some fiery playing by Will and Phil. The band closed out with "Manic Depression," the second tune in which Pat and Jason had switched chairs (so Pat could play the full kit and Jason could focus on percussion) -- this is perhaps Phil's signature song on his "The Jimi Project" CD that sparked this union of kindred souls. This live set may well be up on the KUT website by now (or soon), but to catch the full flavor of this tribute to Jimi's songwriting and message, get thee out to St. David's Episcopal Church on Saturday evening (two shows). For more on the shows, go to http://stringsattached.org. But if you cannot make the show, you CAN listen live on KLBJ-FM and on its Internet site .... and do not be surprised if this show is repeated sometime soon. Now for some TIDBITS - starting with the sad news of the recent passing of Aaron Neville's wife. The Nevilles are special people to this writer and to so many of all of us -- especially since Katrina brought Cyril and many others here to Austin. On a lighter note, I ran into Jon Sanchez of The Summer Wardrobe today at Jo's Coffees on West Second Street - he was tuning their piano (if YOU want him to tune yours, call Strait Music). He is excited about THEIR show at Stubb's on Saturday (well, there is always too much music in Austin to catch all of it) with Youngmond Grand and Brent Palmer. Just got a CD from "The Alice Rose" in the mail after missing their CD release -- beautiful artwork (just beginning to listen) -- and on Tuesday I had stopped in at Antone's Records to drop off a Hendrix Show poster and ran into Papa Mali (and of course the lovely Eve Monsees, who works there) -- and HE gave me his own brand-new CD (which will have national distribution starting in early February) AND the incredible Ruthie Foster CD that he produced for her -- folks, from the cuts I have heard so far, this is Ruthie doing Mavis Staples, Ruth Brown, and Aretha all rolled up into one! I understand that at Ruthie's recent show at The Saxon Pub, the audience stood up and cheered this generous woman and her band. Real Fathers Play Good Music! As their own kids (and many others) look on, Dads Who Rock! (Matt the Electrician and Nathan Hamilton here - plus Michael Fracasso and Beaver Nelson) make happy music at Opal Divine's Penn Field. Hey, Austin dads! Here's a great tip - take your rugrats out to Opal Divine's Penn Field on Sunday afternoons (1-3 pm) to hang with the wonderful children whose fathers comprise the super group, "Pop Stars: Dads Who ROCK!" There may have been more kids than grownups in the audience on Sunday even though the guys -- Matt the Electrician, Nathan Hamilton, Michael Fracasso, and Beaver Nelson -- are singing the songs they normally sing to adults. Now, these guys (and some substitutes, all who must be dads actively involved with their kids) have been doing the Pop Stars - Dads Who Rock! for quite a while now -- but January 7 was their very first show in what is to be a regular Sunday afternoon feature at Opal's HUGE playhouse on South Congress. When the weather warms up, the show will move to the patio, but for now the inside space is cozy and toasty -- and when the kids get done eating and paying attention to their dads, there are lots of board games for them to play. All four of these guys are working on new recordings - Nathan noted he will be getting his full-band rock and roll CD's, "Six Black Birds," within a few days but that he also has a solo acoustic CD in the works (with Craig Ross, Patty Griffin's producer). Meanwhile, though, Nathan will be missing one or two Sundays while he is touring in The Netherlands with Chris Smither and Chris Knight. Beaver said HIS new CD will not be out until May, but if it is as good as his past four, folks from Austin to Amsterdam will flock to pick one up. Michael said he is playing a lot of piano on his upcoming CD, which also will have a horn section (not quite Harry Connick, Jr., but Nawlins funky fo sho). Not sure when it will be available. Matt will be off to Japan in February, but you can catch one of his many January shows and pick up a copy of "One Thing Right," his new CD that is also available at Waterloo. Matt is also a contributor to the wonderful children's record, "Songs To Howl at the Moon By," along with fellow dads Bob Schneider and Jon Dee Graham and some other guys who might not be dads but who also love the little guys. Bottom line -- Pop Stars - Dads Who Rock! 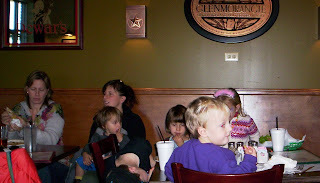 is a very good excuse to go and chow down at Opal's and bring the little ones along for the party. Bring cameras and get their pictures taken with the Pop Stars! [Oh, and by the way, don't be fooled! This is NOT ROCK MUSIC (no Marshall amps here!) - but DADS who ROCK by being real fathers! Who knows? This idea might be catching!